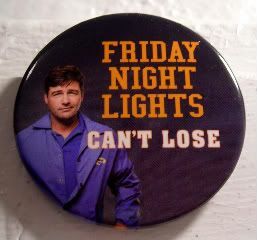 I decided today's the perfect day to use this one, since Variety announced that DirecTV and NBC are picking up Friday Night Lights for not one, but two (!) seasons! Well directed, well written, well acted, well produced - it's just the perfect little show that could. Quality television all around. I'm not gonna lie - the pretty boys (yes, I just unabashedly linked to a bunch of Taylor Kitsch picspam from a friend of mine's LJ site, so any guys reading this, don't click this link) running around a football field don't hurt, either. I mean, who doesn't want to come home to a Coach Kyle at night, no matter how pig-headed he's being. Mind you, I'm managing my own expectations on this deal - two seasons is a pretty big commitment for a show that almost didn't finish the season last year or the year before. And, even if it's only 13 episodes each season, we'll shut up and take what we can get, man. This is one of those shows that people just love. I think it's because no matter where you're from, we all recognize these people, places and situations in our own lives. For me, it's the accents of everyone I ever grew up with down in Salisbury, NC. (Yes, I know there's a difference between NC and TX, thank you.) It's the high school football games I stood in the stands, and marched on the field for. * It's all the teachers and classmates that I had. So, well done, DirecTV and NBC, for taking a chance, and mostly for taking the time to develop an audience for a beloved show. And yay, for the FNL folks! *Yes. I was in marching band. Shut it. And not for nothing, but if I had one thing to complain about for FNL, is that they need a bigger marching band component to make it just a little more real. I'm just sayin'. Alan Sepinwall @ What's Alan Watching?